On Wednesday Oct. 26, St John Fisher hosted the second of two presentations based on The Hate U Give, a novel by Angie Thomas. The enthusiasm people had for this event was evident as Cleary Auditorium was filled with members of the community as well as Fisher students. To kick off the program, Fisher students from Dr. Arlette Miller Smith’s Young Adult Literature class gave presentations that explained the plot of the novel and the history of social injustice on the United States as it relates to the book. The novel is based on a young black American girl named Starr who struggles to find her voice after witnessing the death of her friend Kahlil, who died at the hands of a police officer. The novel follows the difficulties of social relations with authority and how Starr helps to bring justice to her friend and her community. One of the student presenters mentioned how Starr’s “words became her weapon” by the end of the novel, which alluded to the theme of the evening which was using your voice to do what is right. Also present at the event, was Provost Kevin Railey, who spoke on the importance of hosting an event such as this particular series on campus. He stated “Education is a journey to other worlds” and that our local community is “homogeneous”. He also mentioned his hope that this event will educate people into a heterogeneous world of diversity and will encourage Fisher students to become open to the world surrounding them while listening to other people’s experiences. 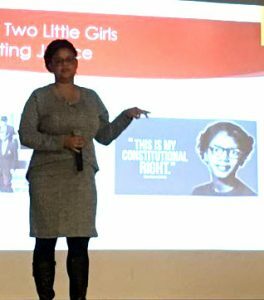 Following Provost Railey’s speech, the keynote speaker of the evening, Dr. Shanna L. Smith, an assistant professor of English at Jackson State University in Jackson, Mississippi began her lecture. Dr. Smith spoke on the ideas of Violence, Victory and Voice: Millennials and Social Justice in The Hate U Give. The overall theme of Dr. Smith’s analysis in her own words was that “voice propels victory.” She emphasized that it is important to use our voices to speak out against injustice because if we do this future generations will be more prosperous. An example she used of Fisher students practicing this concept was through the Clothesline Project that also took place on campus as she was visiting. Fisher students are using their orality to speak out against domestic violence. She encouraged students to continue this practice in the future to bring justice to future generations. Overall, sophomore Brigid Joyce claimed she “enjoyed learning about the book and was happy Dr. Smith was able to come and speak to us about The Hate U Give”. Furthermore, she expressed how she was “impressed by the student presenters and their hard work”. In comparison, freshman Maddy Morgan expressed how she went to the event for her sociology class. Although she stated the event was not particularly her favorite she has attended at Fisher, she did mention hoping that Fisher would continue doing similar events in the future. 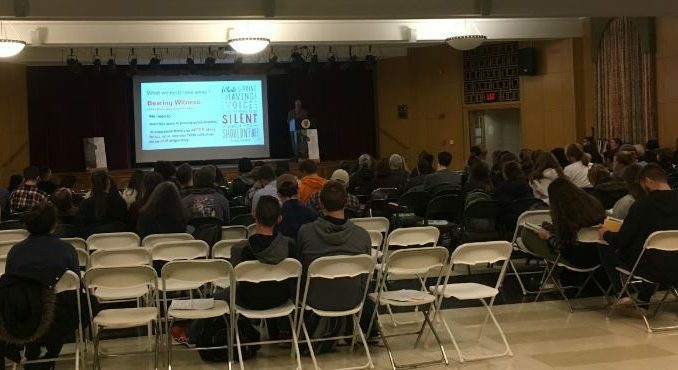 Dr. Smith also made a presentation on Tuesday Oct. 24 on the topic of “”How Young Adults Bear Witness Against Social Injustice,” which also drew from The Hate U Give.